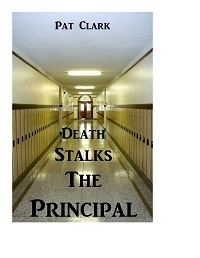 When the principal of a small high school in northern Wisconsin is murdered, teacher Cynthia Allen agrees to take over the job. She’s got support from the superintendent, the students, and most of the staff, but she has no idea how crazy things can get: kids with problems, kids who cause problems, teachers with grudges, parents with agendas, and one more thing: The person who murdered Bill Deagan isn’t done killing yet. Everybody went to school, so everybody thinks they know what it’s like, but teachers and principals have unique perspectives. There are things we know that can’t be told, there are people we’d like to punch but can’t. I had a fun idea for a mystery where a teacher becomes principal and has to solve tons of problems, one of which is the murder of her former boss. Are any of the characters in the story real? No, but I think you might “recognize” people you’ve met in education: teachers, administrators, staff, parents, and students. Some of them make a room nicer when they enter, and some make it nicer when they leave. The characters were easy. If you went to high school, you know about the “cool” teachers and the “creepy” teachers. You know that some at school seemed to want you to fail while others simply wouldn’t let you do it. Students, too, fall into loose categories, serious, not-serious, troubled, and clueless. I chose the ’80s as the time period for this book because it was such a fun time with very colorful characters. Who can forget ’80s kids in parachute pants with rainbow suspenders? The truth is pretty simple. Returning to my classroom from an errand, I saw Chickie, a master at inventing reasons to leave her assigned class, standing at the mesh-reinforced window of the gymnasium. She wore a white blouse with the collar turned up under a pink sweater and pegged jeans so tight she could hardly move. At one side of her teased, hair-sprayed mass of dyed-blond hair was an oversized neon bow. The outfit was fashionable, but it didn’t flatter Chickie’s plump figure one bit. She didn’t notice my arrival because she was making faces at someone inside the gym. With a little sigh at the delay, I started down the hall to see what our resident hypochondriac was up to this time. When she saw me heading her way, Chickie disappeared down a side hall leading to the school’s back door. Aware it was a fool’s enterprise, I followed, determined to send her back to class, at least for a while. When I turned down the short corridor, everything changed. Chiquita stood a few steps away from me, a horrified look on her face. We both stared at the still form just inside the metal double doors for a few seconds. He wore a dark suit, a shirt with vertical stripes, and a slim tie. The blood pooling under his head made it hard for my lungs to pull in air. Chickie’s weren’t similarly affected. After the briefest delay, she emitted a noise like an ambulance siren, soft and distant at first then soaring to full, screeching volume. One week after Maribel High’s first murder ever, I opened the folder of essays my writing class had turned in, my interest slightly guilty. It was the sort of opportunity no English teacher can resist, a chance for students to write on a topic that’s real and compelling. The atmosphere had been unusually still as I explained the assignment, except for the noise from the hallway where a janitor hammered away at a jammed locker door. I specified the number of words as a matter of course. It’s always the first question, and the answer has to be repeated many times. Students often don’t bother to read directions. Why should they when they can just ask the teacher? The rough drafts, finished in record time, were stacked neatly in the folder, ready to be graded as my new schedule permitted. The annoying buzz of the clock behind me signaled time’s relentless passage, and I opened Chickie’s essay, since her name, beginning with a B, came alphabetically first in that class. Since Chiquita plans to be a journalist, she practices her craft by emulating our local news team, which makes a slightly singed barn sound like the Great Chicago Fire. At least this time she had something more than rumor to report. In her story, she was the star. I was merely the inciting incident, present but practically useless. At about 10:50 am, I began feeling nauseous in third hour art class due to noxious paint fumes that trigger my allergies. I told Miss Bennett I needed to leave for a few minutes to recover. After a drink I began feeling better, so I went to see if Alaina was in sociology class to talk to her about something important and personal. Warner was teaching for once, though, so I left. To be descriptive for anyone who doesn’t know, the main part of our building forms a big square with the gymnasium in the middle and classrooms all around it. The back hall runs along the gym, and on either end of it there are shorter ones that lead to the back doors. The hallway was eerily quiet, as if it knew something terrible had happened. Glancing down at the exit doors as I passed, there he was. I gasped in horror but didn’t at that time realize who I was looking at. I thought someone had a heart attack or something. When I stepped closer and saw blood on the floor, I knew it was bad. That’s when Mrs. Allen showed up. She froze in shock, but I realized we had to call the authorities right away. I hurried to the office, not hysterical like some people say, but quickly because of the emergency. Mrs. Allen stood guard at the end of the hallway so no one else would have to look upon the horror that scorched our eyeballs. Mrs. Patterson was at her desk. She doubted me at first, like usual. She never believes I need to call my mother when I’m not feeling well either. Honestly, she’s just a secretary. It’s not her place to comment on how often I get a migraine. Anyway, Mrs. Patterson ordered me to wait in Mr. Deagan’s office and not talk to anyone. I did, because Mrs. Patterson makes you feel like you have to do what she wants. I sat for a long time, unknowing what was happening. Finally a policeman came in and asked me lots of questions, which I answered with utter completeness. I think the murderer was a bum looking for money so he could get to Florida for the winter. No one here would kill anyone and leave him for someone to find who might have a heart condition or something and die of shock.